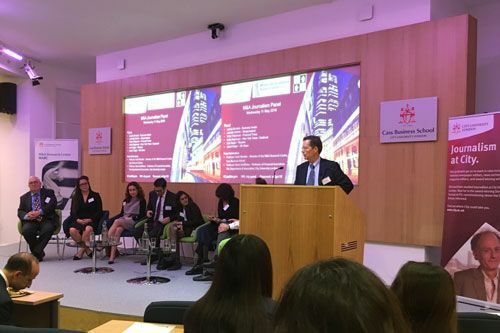 The Mergers and Acquisitions Research Centre at Cass (MARC) and The Department of Journalism at City University London hosted a panel discussion and audience debate looking at the past, present and future of M&A reporting. More than 100 professionals, journalists and students attended the breakfast briefing which was co-chaired by the Director of MARC, Professor Scott Moeller and Professor Steve Schifferes, Professor of Financial Journalism at City. Below are selected comments from the event. A full audio recording of the discussion is available to listen to here. How has coverage changed in the last 10 years? Anita Raghavan: “More than a decade ago, when you were covering merger and acquisition as a journalist, you had the luxury of time - you could develop a story. Back in 2001, when I was looking at a three-way merger, I learned about that merger tip probably about three months before the deal happened so I really had time to work the story. Today, I think speed is paramount and you have so many more outlets covering mergers - I think for all of the major newspapers, The [New York] Times, the FT, the Journal, I think the bar has had to drop. “Today, you see a lot of deal stories where talks at a very early level are written about and the deal doesn’t come to pass. I think it’s because many newspaper outlets including The Times and the Journal that in the old days would have stayed away from those stories have to jump in for competitive purposes”. Lianna Brinded: “I think [coverage changed] with the birth of the internet and pure online journalism that doesn’t have a pay wall. At the same time, while that has been evolving there’s also been changes in take-over rules which work in line with the need for speed and accuracy. Online itself demands speed but at the same time those small rumours that you wouldn’t necessarily have reported on before could now be a lot bigger news because you only have, let’s say, 28 days for a merger deal to be on the table and for it to be finalised”. Lina Saigol: “The pressure of speed has changed the big think pieces on M&A quite a lot because a deal may not be real, it may be in early talk stages, but because of the competition, all the media outlets want to do a thousand word piece when the deal isn’t actually happening. There’s a breathlessness about it so you will get reams and reams of coverage on something that’s not actually real yet”. Jason Singer: “I think what the market is missing now is this concept of M&A as a soap opera – there’s a cast of characters, there’s big dramas and little dramas, there’s uncertainty, there’s relationships. While you used to be able to craft that soap opera over a series of stories, now you just get rumours written as fact and fact written as rumour”. What does the future of M&A reporting look like? Lianna Brinded: “It’s not just putting words on paper any more, you have to think about how we can tell the story across various mediums. Sometimes having those videos - even if it is just a small snippet of the CEO getting that one line out of a five minute video and putting that within the story – that’s more important than just writing loads and loads of words”. Lucinda Guthrie: “We do use data a lot more in our reporting now – we monitor what people are looking it so you do have an idea about what has been popular and that in turn helps you to guide reporters”. Jason Singer: “Commercially, it should be that not all clicks are worth the same. So you might have fewer people reading the in-depth story but those people should be worth more advertising dollars than the mass market that reads about something happening just because it has a good headline to it. So, hopefully the market develops in that way where you can build specialist products that are high quality”. A full audio recording of the discussion is available to listen to here.